King penguin colony with over 200,000 birds. Salisbury Plain is a fantastic place, especially on a sunny day. It was raining and very misty the first time I visited this huge King penguin rookery in South Georgia Island, and I didn't realize the enormity of this colony. My second visit to Salisbury Plain was on a sunny day. We were able to climb the hills behind the beach and were greeted with this spectacular view overlooking the King penguin colony. The number of birds, the sound and the distinct smell of penguin guano makes this place unforgettable. Salisbury Plain is situated in The Bay of Isles at the northern tip of South Georgia Island. Be sure to include this place if you ever plan a trip to South Georgia Island. Salisbury Plain visitor management plan. Salisbury Plain is a fantastic place. 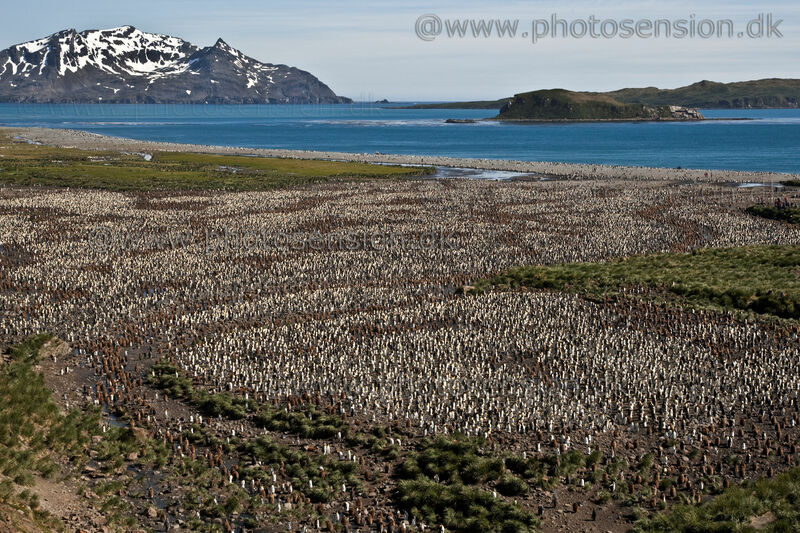 The huge King penguin colony with over 200,000 birds is an unforgettable sight.